I recently attended an exhibition reviewing the relationship between graphics and politics over the last ten years. 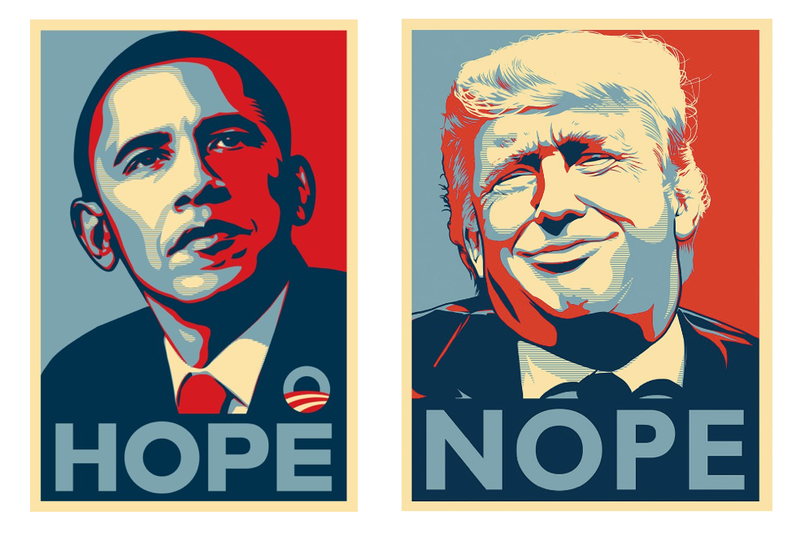 ‘Hope to Nope’ (The Design Museum, London, until 12 August) considers various political and protest movements in the decade since Shepard Fairey’s famous 2008 ‘Hope’ poster in support of Barack Obama’s Presidential bid. It displays banners, posters and memes; stunts, symbols and slogans; from Occupy and Deepwater Horizon, to Taksim Square and Charlie Hebdo; from Brexit and the 2016 US election, to women’s marches and Black Lives Matter… and more besides. We live in turbulent times. You can’t help but be impressed by the lucidity, wit and invention of many of the pieces. You can see earnest Soviet posters subverted to include rainbow Pride colours; playful Jeremy Corbyn emojis; sinister Guy Fawkes masks; an ominous Trump fortune teller. In Hong Kong in 2014 protestors collectively adopted umbrellas, initially to shield themselves from the sun, and subsequently from tear gas. In Sao Paolo in 2015/16 marchers against tax rises and government corruption rallied to the theme of ‘I will not pay the duck.’ ‘Pay the duck’ means take the blame for something that is not your fault. Of course, the language of protest has been familiar to us for many years. But in the digital age the impact of traditional approaches has been amplified by social media, memes and hashtags. Campaigns are easier than ever to initiate, endorse, adapt, share and spoof. As I wandered around the museum, I found myself wondering why the best rallying cries seem so compelling; why it is helpful to condense complex issues into catchy rhymes and phrases. Why do slogans matter? Many years ago a girlfriend left me. I became depressed, inert, isolated. But more particularly I found I was completely inarticulate about how I felt. I couldn’t explain what had happened, why she’d gone, what I’d done to deserve this. I took to going running round a local park. And as I ran I gradually pieced together in my head a narrative about what had gone wrong. I composed the speech I would deliver if I ever saw her again. And with every passing day and every exhausting circuit, the oration grew in clarity, brevity and articulacy. Then, at last, my speech was perfect, crisp and concise. And I realised at that moment that I didn’t need to make it. I had moved on. I wouldn’t have to run round that muddy park again either. Some experiences are so intense, emotional, complex and confusing that we feel only unfocused anger, foggy regret, dim despair. We become powerless, helpless, listless. It’s only when we can distil our feelings into words and phrases – when we can articulate our anger - that we can begin to recover and become capable of action. Like any well-crafted copy, the best political slogans define how we feel about an issue; compress it into something clear, precise and strong; find fellow feeling with others; and motivate us to get out and do something about it. But there are limits to what graphics and slogans can achieve. After an hour at the exhibition, having walked through an aggregation of witty words, angry sentiments and cool design, I began to worry that mass protest is becoming almost effortless in the social era. It’s just a little too easy to like and retweet; to post and hashtag; to endorse, sign up and send on.